Writing:We talked about the children in Syria and how they need our help followed by some journal writing on how we can help. Students also watched a short video. Math: Math book pages 99-100. 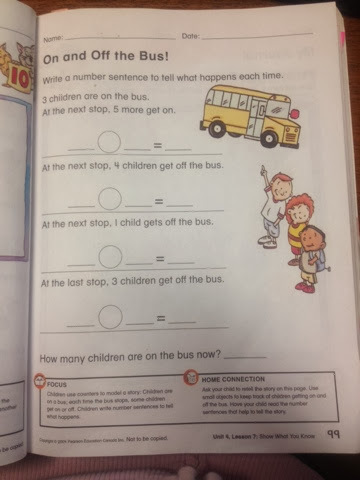 Home Connection: Ask your child to retell the story on page 99 which was a bout children getting on and off a bus. Use small objects to keep track of children getting on and off the bus. have your child read the number sentences that help to tell the story. page 100: Ask your child: " What do you like best about adding and subtracting? Why do you think addition and subtraction are important?" Science: Students presented their projects and we discussed the projects that were presented today. We enjoyed the presentations very much masha'Allah! Students who will be presenting tomorrow are: Layan, Sarah, Hamed, Shaymaa, Sajad, Hamza K and Khadeeja. Art: The students finished their place mats based on the four food groups. The deadline to donate for our brothers and sisters in Syria is tomorrow, December 19. This is the least we can do for our brothers/sisters in Syria. Please send money, blankets or jackets. Talk to your child about how they need our help and the importance of charity. We will be having a potluck tomorrow inshaa Allah. Don't forget to send a food item with your child to share with his or her friends.